Your wedding day is more than a party for your friends and family – it’s a romantic celebration for you and your sweetheart to treasure together. In years and decades to come, the mere thought of your starry-eyed nuptials should give you goosebumps. Through the ups and downs of marriage, you’ll always look fondly on your wedding day and the love you felt for one another while saying “I do”. Forget the usual hometown ballroom affair. Marriage is the adventure of a lifetime; your experience should set your heart racing in the best possible way! Where better to start your forever than in resort paradise? You’ll enjoy not only a picturesque backdrop for your ceremony, but also a variety of romantic activities in the lead-up to and immediately following your nuptials. From couples’ massages to rosebud-adorned villas, romantic touches should permeate every moment of your adventure abroad. Choosing to wed away from home is the easy part. Selecting a resort may prove more challenging. While dozens of resorts provide beachside fun, some prompt more swooning than others. 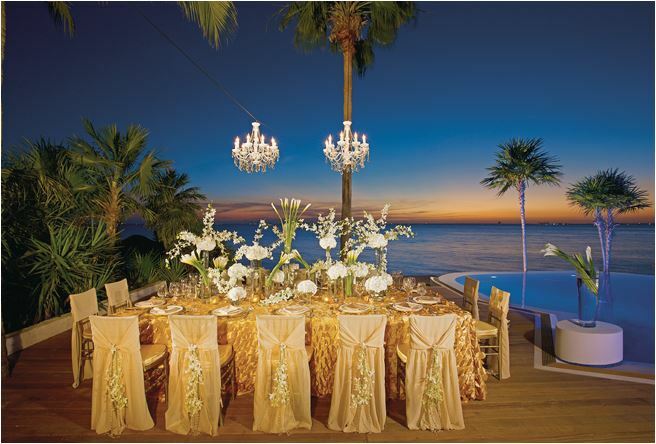 The ideal romantic resort is serene but can also throw a rocking reception. Remember, the ceremony is just one aspect of your destination wedding. While you want the most beautiful venue possible, you’ll also want plenty of activities to keep you and your guests entertained after you tie the knot. Le Blanc Spa Resort Cancun is the top-rated all-inclusive resort on TripAdvisor, but the distinctions don’t end there; Le Blanc also won the 2018 Travvy Award for Best All-Inclusive Luxury Resort and was highlighted in the Travel + Leisure World’s Best Awards. 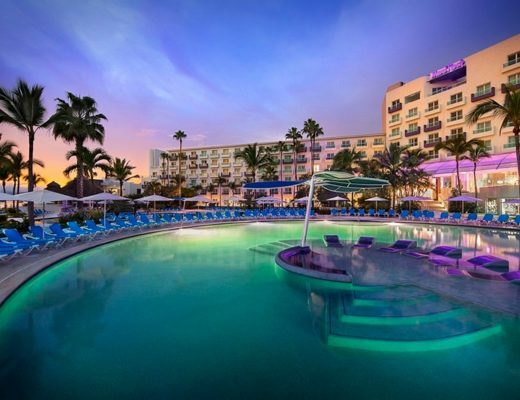 The resort has maintained the coveted AAA Five Diamond Award for six consecutive years. As you and your sweetheart explore the resort hand-in-hand, you’ll quickly discover why it has earned so many awards over the years. Romantic to its core, Le Blanc infuses every detail with passion. Dining experiences at Le Blanc are especially romantic; get those butterflies going while pampering your palate at Lumiere or beneath the chandeliers of Blancitalia. The morning after your ceremony, you’ll receive an intimate breakfast in bed. Personalized service sets Le Blanc apart. Every detail you’ve imagined will be carried out. With nearly one staff member for every guest, pampering is guaranteed not only for the bride and groom, but for your entire wedding party. Wed on the beach surrounded by white sand and bamboo accents, or in a luxurious ballroom alongside your best friends and closest family members. If you schedule an early evening wedding outside, you can catch a glorious sunset during your ceremony. Despite Cancun’s eastward orientation, a picturesque lagoon next to Le Blanc ensures full sunset visibility. Embrace adults-only sophistication at El Dorado Maroma, an elegant Riviera Maya resort listed as one of the best in the world by the Condé Nast Traveler Readers’ Choice Awards. 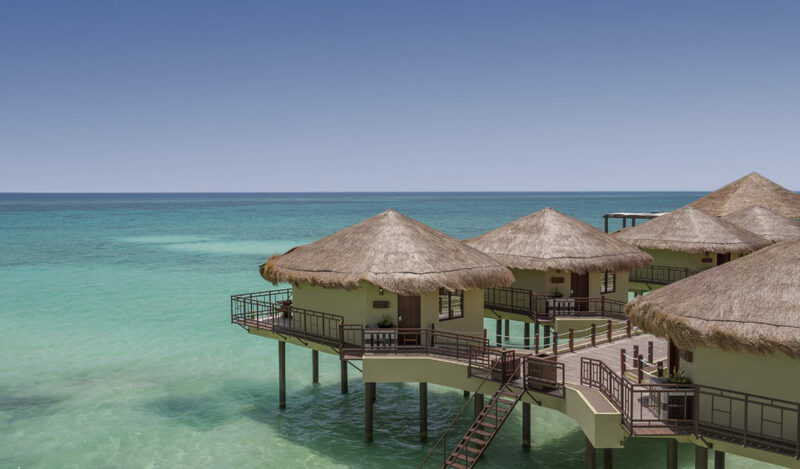 Escape to your private enclave: an overwater bungalow or a luxury suite featuring a Jacuzzi. You’ll be greeted with a champagne toast upon arrival, and sent off with fond memories when you reluctantly depart. Several romantic features set El Dorado Maroma apart, but perhaps none more than its picture-perfect location on the renowned Maroma Beach. Despite its proximity to Cancun, Maroma provides a secluded ambiance. Immerse yourself in a dreamy world of white sand, azure water, and relaxed days of sun-soaked pleasure. 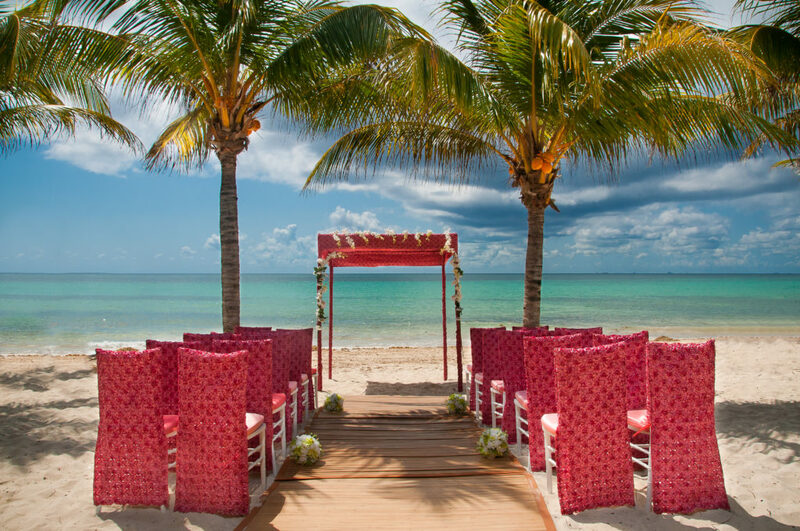 This stunning beach serves as a top venue for El Dorado Maroma’s gorgeous weddings. If you desire something a bit more traditional, book your wedding at the resort’s onsite chapel. The chapel’s exterior makes for a great photo opportunity, while the interior is tastefully decorated with floral arrangements and drapings. Your nuptials should be entirely stress-free; let your wedding specialist and onsite coordinator take care of the details. The villas of Casa de Campo Resort are among the most lavish in the Caribbean. Whether your villa overlooks the ocean or the lush scenery of La Romana, you’ll look forward to relaxing in your private enclave after a busy day in paradise. Ideal for golf lovers, the resort boasts three exceptional courses: The Links, Dye Fore, and Teeth of the Dog. Awake to a magnificent sunrise view and breakfast prepared right in your villa. With this level of onsite pampering, you’ll find it tough to leave your personal paradise. If anything can coax you away from your villa, however, it’s the promise of romance at Casa de Campo’s natural sanctuary: Minitas Beach. Relax in a chaise lounge alongside the love of your life. Your sweetheart will look stunning before a backdrop of gently swaying palm trees and turquoise water. 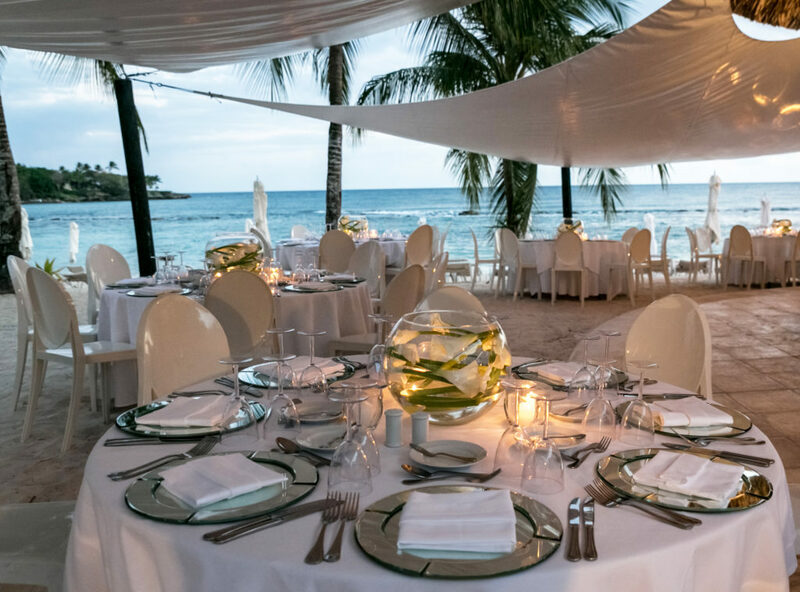 Whether you desire a simple beach wedding or a traditional ceremony, you’ll appreciate the range of beautiful venues available at Casa de Campo. Perhaps the most unique: a stunning Catholic ceremony either inside or on the steps to a charming church. A floral arch sets off the intricate beauty of Casa de Campo’s Chavon Plaza – an ideal venue for small ceremonies. 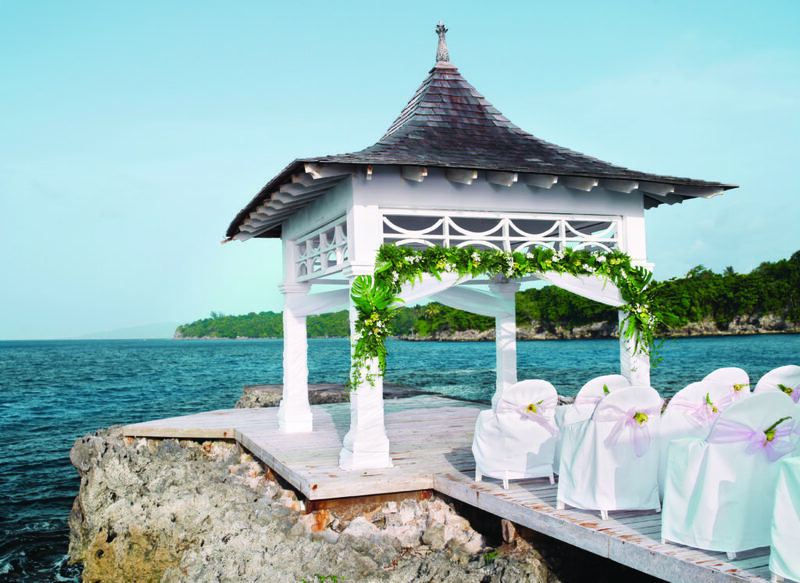 An Ocho Rios gem, Couples Tower Isle delivers cherished memories in one of Jamaica’s most idyllic settings. 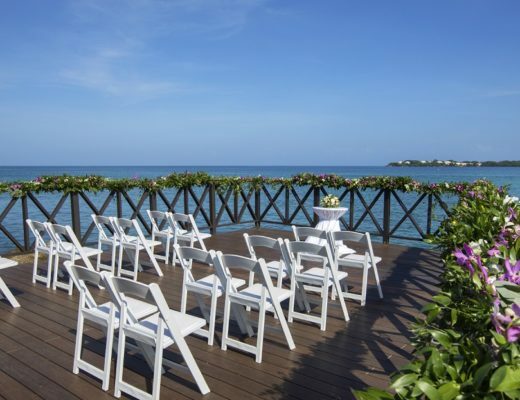 Like all Couples resorts, Tower Isle offers a signature venue: a private island, where you can experience true serenity while reciting your vows. This island setting features a gorgeous gazebo adorned with your favorite flowers. Other wedding venues include a private beach and a lush garden. Whether you throw a party for two or invite a larger group, you’ll embrace the carefree vibe of Jamaica. The decor and architecture at Couples Tower Isle are just as stunning as the natural scenery of Ocho Rios. Pearlescent tiles, vibrant murals, and chic photography grant the resort’s interior areas a contemporary feel. Lime green touches give the interior an extra punch, especially alongside the majestic white architecture. At Couples Tower Isle, the romance doesn’t end with “I do.” From there, you can enjoy the best of newlywed bliss in a wondrous setting. Following the wedding, begin married life on the right foot with breakfast in bed and an intimate dinner on the beach. Relax with a full spa experience in one of Tower Isle’s peaceful Oasis Spa Villas. Unlimited spa treatments and a private plunge pool await. You’ll enter your married phase of life feeling completely relaxed, at ease, and in love. Exotic romance awaits at Riviera Maya’s Blue Diamond Luxury Boutique Hotel, where you’ll enjoy private access to the beach from your suite. Gaze out vast windows at the resort’s mystical cenote and lagoon. Several suites feature outdoor, yet completely private tubs – the perfect place to sip champagne after a long day of exploring. Each accommodation is unique; depending where you stay, you may encounter a private dock, a rooftop terrace, or a beachfront location. No matter which suite you call home during your getaway, you’ll be awe-struck by the scenery. Individual flair isn’t just for accommodations; it’s a hallmark of weddings at the Blue Diamond Luxury Boutique Hotel. With 2,260 square feet of versatile venues, it’s easy to design the ceremony and reception of your dreams. South Beach style infuses ceremonies by the main pool, while the spa pool allows for a more intimate affair. 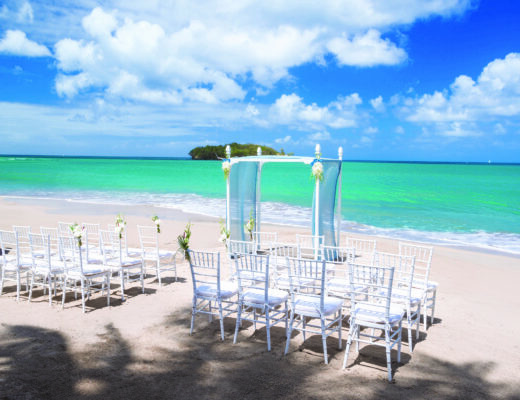 You can also wed on the beach before awe-inspiring natural scenery. One-of-a-kind rehearsal dinners and receptions can be held on the beach, by the pool, in the Salon Diamond Ballroom, or in the cigar lounge atop the Ambar Restaurant. Luxury saturates every moment at the Blue Diamond Luxury Boutique Hotel. The fun begins with in-room champagne during check-in and continues with couples’ massages to relax you before the ceremony. All the senses are targeted here. Enjoy lagoon views, the sultry sound of saxophone during the reception, the beautiful scents of floral arrangements, and, of course, the exquisite taste of gourmet hors d’oeuvres. Situated on the western coast of the island of St. Lucia, Jade Mountain provides the ultimate escape from the real world. Mountain and ocean scenery join forces to grant the resort one of the most visually astounding wedding backdrops imaginable. Breathtaking views take center stage, but the resort’s architecture is just as impressive. Designed by famed Canadian architect Nick Troubetzkoy, the resort aims to break away from the ‘cookie cutter’ feel of other Caribbean hotels. The goal: a personalized and entirely unforgettable resort experience. Jade Mountain staff members refer to all accommodations as sanctuaries – an apt description given their private settings and nature-oriented designs. The fourth wall in each sanctuary opens to provide a stunning view of the ocean, while still ensuring complete privacy. Vast infinity pools make guests feel one with nature. 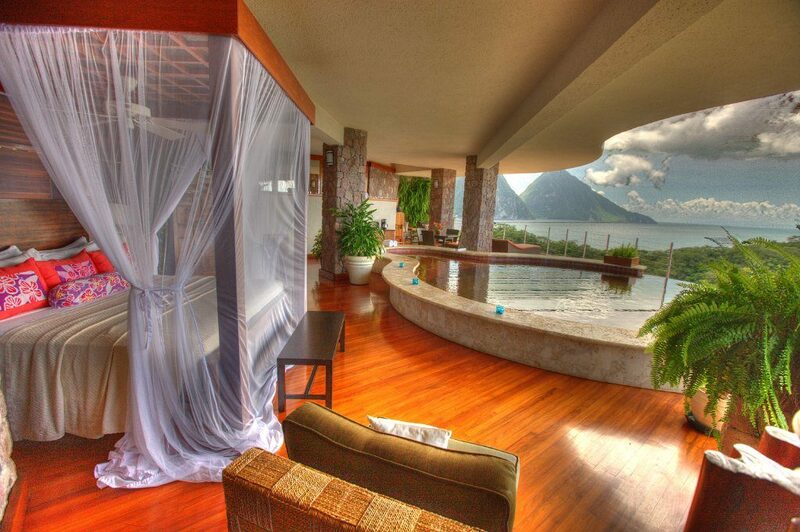 Weddings at Jade Mountain are just as unique as the resort’s accommodations. Don’t book here if you intend to invite dozens of guests; with just 24 sanctuaries, Jade Mountain can only accommodate a small group. If, however, you demand an intimate wedding, you’ll quickly come to view limited accommodations as the resort’s greatest strength. An absence of human distraction means you can focus on the natural sights and sounds of St. Lucia. Choose from a variety of serene wedding venues. Take a water taxi to Anse Mamin Beach, or ascend the Stairway to Heaven at the Anse Mamin Plantation. Take in panoramic views of a UNESCO Heritage Site at the Celestial Terrace. Feeling adventurous? Repeat your vows with sign language and slates during the optional underwater portion of your ceremony. A domestic wedding can be just as romantic as international nuptials, as you’ll discover while exploring Four Season Maui at Wailea. Overlooking the acclaimed Wailea Beach, this picturesque resort brings a unique flavor to the destination wedding experience. Gaze at swaying palm trees as you commit to a lifetime of love or walk down an outdoor aisle strewn with rose petals as you take in the resort’s immaculate plumeria garden. No matter where you wed, you’ll enjoy attentive service from coordinators who care. Four Seasons maintains a strict one wedding per day policy, ensuring you take center stage on the most important day of your life. 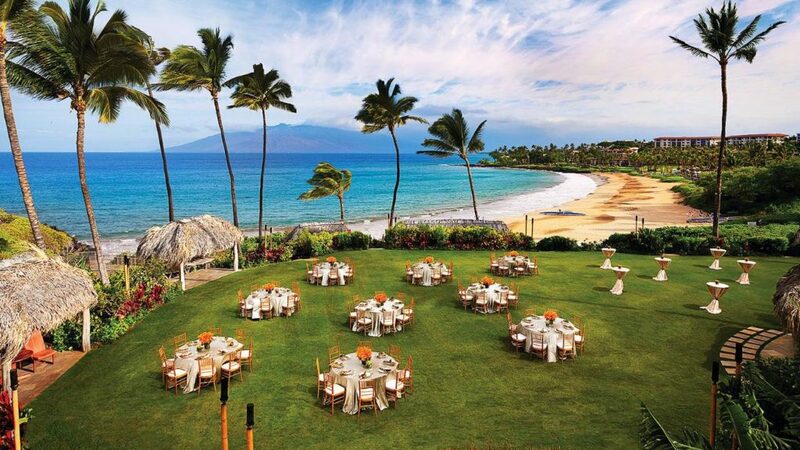 Infused with Hawaiian charm, Four Seasons Maui at Wailea delights wedding parties with small, yet memorable details. Grooms wear Hawaiian maile leis, while brides carry bouquets containing native tropical flowers. Enjoy live Hawaiian music during the ceremony, or, if you prefer, your favorite song played by a talented violinist. 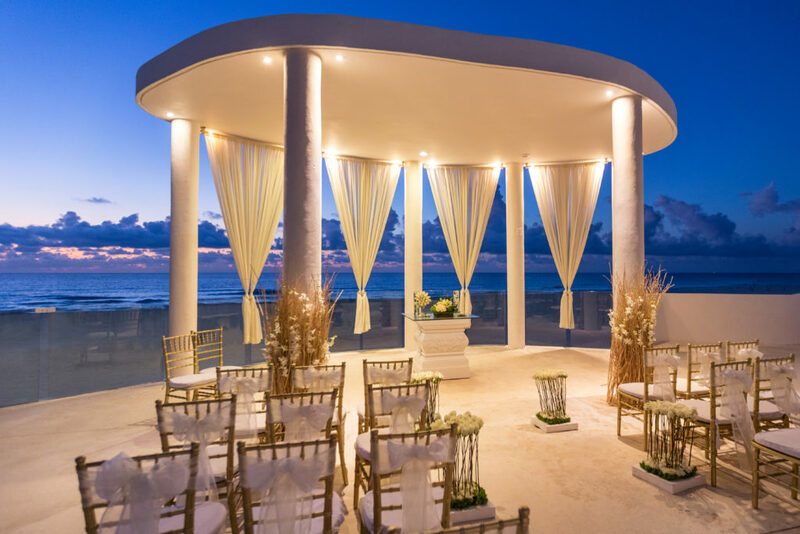 For the reception, party in a pristine oceanfront setting, or head inside for a candlelit affair. Later, unwind with a beachside couples’ massage and a private cabana at the Oceanview Serenity Pool. Jamaica’s laid-back ambience and vibrant culture appeal to adventurous yet chilled out couples. These opposing characteristics play a central role at The Caves, where you and your bride or groom are encouraged to relax before, after, and during your nuptials. 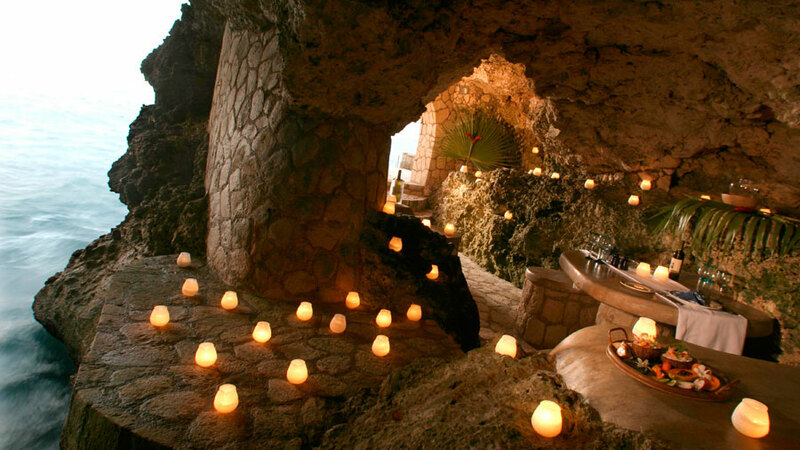 If you love grottos, you’re in luck; not only can you hang out in a grotto-based rum bar, you could say “I do” in a magical grotto setting. Because every couple that stays at The Caves is unique, every room also features unique details. All boast charm, character, and unforgettable views. Several of the resort’s accommodations are specifically designed for lovers. For example: Two Birds delivers a romantic ambiance with a cozy loveseat and louvered windows for extra privacy. Likewise, the Blue Hole View Suite sets the scene with a king-size bed, a stained glass window, and an awe-inspiring view of Negril’s most beautiful cave. While you and your partner could happily retreat to your suite and spend the entirety of your getaway alone, you’ll eventually want to emerge for the ceremony and reception. If anything can convince you to leave your comfortable accommodations, it’s the promise of an unforgettable ceremony in a picturesque cave overlooking the crystal clear waters of Negril. Larger ceremonies are better suited to the resort’s historic lighthouse venue. Either way, your wedding will look unlike any resort-based ceremony you’ve seen. Across the bay from the hustle and bustle of Cancun lies the blissfully quiet Isla Mujeres. This idyllic island is home to Zoetry Villa Rolando Isla Mujeres Cancun – one of the region’s most romantic resorts. Serenity and personalized attention are guaranteed; as a guest, you occupy just one of 35 spacious suites. When you arrive, you’ll be greeted with a welcome bottle of tequila. Additionally, you’ll receive a bottle of sparkling wine every day, alongside fresh fruit. Relax in the therapeutic shower or steam bath – and take advantage of complimentary Bvlgari® bath amenities. Enjoy a breathtaking view of the sunset from the comfort of your private terrace. The small moments are often the most breathtaking, as you’ll discover while luxuriating in the beauty and privacy of your suite. Venture beyond your accommodations to check out the Thalasso Spa – a source of both rejuvenation and romance. Book a couples massage; you and your sweetheart will emerge feeling completely relaxed, and completely in tune with one another. Designed exclusively for couples, Sandals Grande St Lucian offers all the hallmarks of an all-inclusive getaway, but without the crowds. You and your partner will feel completely at peace as you relax on the soft sand beach or stroll through perfectly manicured gardens. An ideal wedding destination, Sandals Grande St. Lucian provides some of the best venues in the Caribbean. Wiggle your toes in the sand as you make the ultimate commitment or gaze at island flowers while celebrating on a spacious terrace. 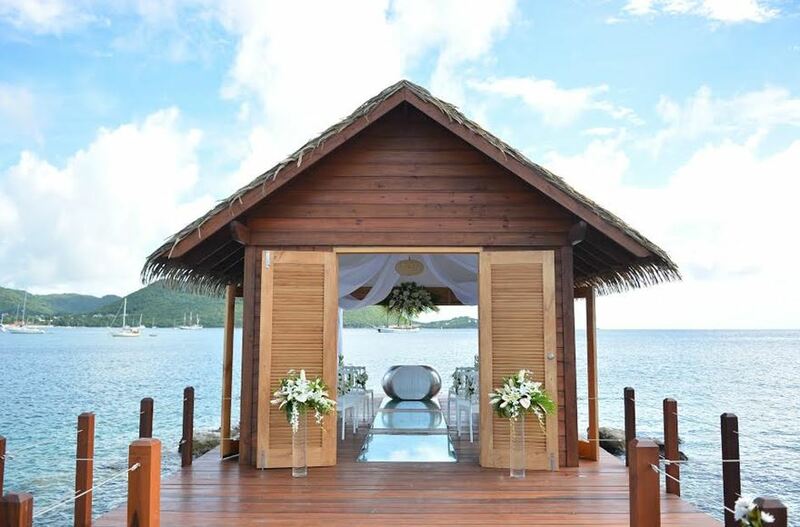 Better yet: the recently unveiled Overwater Serenity Wedding Chapel, which offers panoramic views of Rodney Bay for you, your partner, and 20 of your closest friends or family members. Walk down an aisle lined by glass panels, which grant a close look at the crystal clear water below. Where better to retreat after an over-the-water ceremony than to an equally gorgeous over-the-water bungalow? Featuring swim-up sundeck platforms, hammocks, and soaking tubs, these palapa-style accommodations encourage you to immerse yourself in the tranquil environment of the Caribbean. Exquisite Rondoval Suites are just as romantic; these private accommodations provide a serene, yet sensuous post-wedding escape. Whether you dream of an intimate church ceremony, vows on a white sand beach, or days of tropical celebrations, a romantic destination resort can deliver every detail you’ve imagined – and more. Your wedding should set the stage for a lifetime of love and laughter; where better to begin your new life than at one of the most romantic venues in the world? Go beyond ordinary with dreamy nuptials you’ll cherish forever at one of the most romantic places to get married.